Affairs Remembered has earned a steller reputation for professional service and high quality events. Our Design Team combines over 17 years in the industry with professional project management, an artistic flair for signature design blueprints, breath taking decor & tablescapes and a host of knowledge that will aid to produce an event filled with creative perfection. 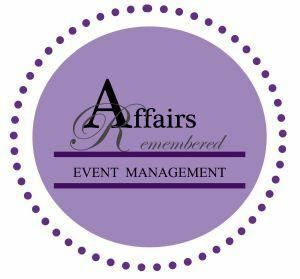 Affairs Remembered is a full service, Baltimore based, wedding and event planning, design & decor firm, serving the Maryland, Washington DC and Northern VA areas. Are you planning an intimate celebration in Maryland? Want to throw a shower, birthday celebration or social event for 100? We can assist you in concept and colors, with our pre-selected linens to coordinate with centerpieces and place settings, at our design studio. These creative details will set your event apart and keep your budget in tack. These Pre-Styled Décor packages, tailored to fit everyday budgets, include wedding/event "must haves", from linens to centerpieces with accents. For the D.I.Y. client or the couple who's budget does not allow contracting a professional for full or partial design & décor, I HIGHLY recommend one of these packages. This classic pre-styled package is composed of hand selected cotton table lines and napkins, along with chair covers & coordinating sashes. Centerpieces composed using a mix of white and ivory shaded florals, creating a clean and sophisticated aesthetic. Package is designed for up to 100 guests and includes everything needed for a casual yet classic design. •Up to 10 floor length poly/cotton table cloths. •Up to 100 poly/cotton color complimenting napkins, with basic napkin fold. •Up to 100 black, white or ivory chair covers. •Up to 100 color complimenting chair sashes. •A specialty cake table linen, with posh overlay. •Up to 10 bowl/square vase floral composed centerpieces, atop circle/square mirrors, coordinating stone or gem accents and "enclosed flame" votive cup with candles. OR •Up to 10 bowl/square vase floating floral head(s)/floating candle(s) composed centerpieces, atop circle/square mirrors, coordinating stone or gem accents and "enclosed flame" votive cup with candles. •Color wash up-lighting for cake table. * Please note: Pre-Styled Package pricing does NOT include site visit and walkthrough and additional fees may be applicable if event takes place outside of the Baltimore Metro Area or surrounding counties. These are not planning or event management packages. Are you planning an intimate celebration in Maryland? Want to throw a shower, birthday celebration or social event for 100? We can assist you in concept and colors, with our pre-selected linens to coordinate with centerpieces and place settings, at our design studio. These creative details will set your event apart and keep your budget in tack. These Pre-Styled Décor packages, tailored to fit everyday budgets, include wedding/event "must haves", from linens to centerpieces with accents. For the D.I.Y. client or the couple who's budget does not allow contracting a professional for full or partial design & décor, I HIGHLY recommend one of these packages. A boutique pre-styled package composed of hand selected satin and or sheer fabrics in an array of tones. Paired with chair covers & complimenting sashes or chiavari chair cushions. Height variation centerpieces, composed using a mix of accent tones against shades of white and ivory florals, lend itself to create a polished and sophisticated aesthetic. Package is designed for up to 100 guests and includes everything needed for a dramatic design. •Up to 10 floor length satin table cloths •Up to 100 color complimenting satin napkins, with premium napkin treatment. •Up to 100 black, white or ivory satin chair covers. OR •Up to 100 color complimenting chiavari chair cap cushions. •Up to 100 color complimenting sashes. •A boutique cake table linen, with complimenting accent pieces. •Up to 5 low centerpieces composed of Hydrangea mixed with accent toned florals, atop circle/square mirrors, coordinating stone or gem accents and "enclosed flame" votive cup with candles. •Up to 5 Eiffel tower vase - lush rounded floral composed centerpieces, atop circle/square mirrors, accent crystals, pearls and feathered accents. "enclosed flame" votive cup with candles. OR •Up to 5 tall cylinder vase submerged floral composed centerpieces, atop circle/square mirrors, accent stones or gems and "enclosed flame" votive cup with candles. •Color wash up-lighting for cake table. •Color complimenting up-lighting for "Guest of Honor" area. A full-service event planning and event decor company, specializing in private and corporate events. Affinity One Events is dedicated to capturing, managing, coordinating and designing its client's vision. The planners and designers of Affinity One Events are professional, experienced and talented. We transform your event to an experience.